I love this vintage treasure. It is a vintage gold-filled locket with a carved glass cameo on the top. It has a beautiful rose-ivory background with a white lady. It is prong-set onto the locket. The locket opens to hold one photo under a metal frame which can easily be removed to allow your photo to rest there. This locket is hanging on a GORGEOUS gold-filled chain. The patina of the locket and chain compliment each other to perfection. 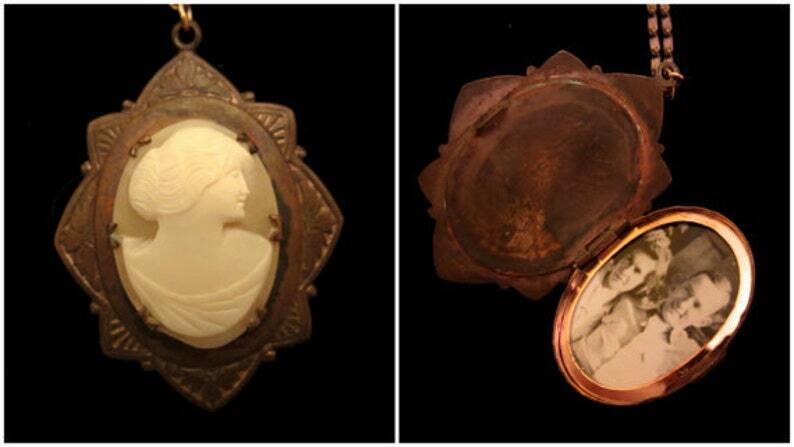 As these pieces are old, they do show signs of age, most notable to the finish of the locket. The chain measures approximately 28 inches and the locket hangs approximately 2 inches from the chain.